WHEN THE STARS RODE THE RAILS – PART 2: MOVIE STARS & TRAINS – SMARTT: Scale Models, Arts, & Technologies, inc. Yes, she arrived on the Super Chief all the way from Chicago, she has officially Chiefed! That was the term used by Hollywood Types for doing the Chicago to Los Angeles trip on the Super Chief for the first time. 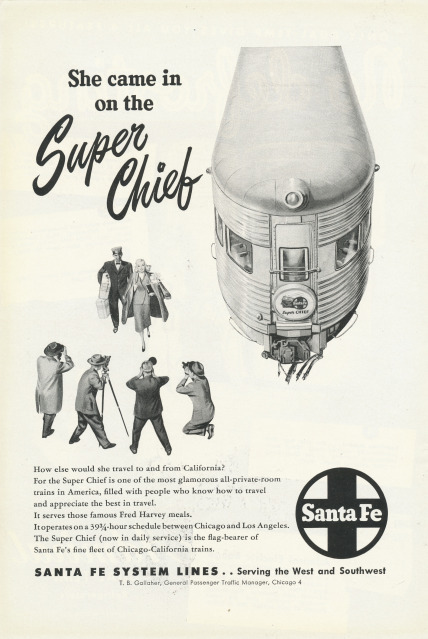 How many stars and starlets arrived in Los Angeles on the Super Chief is anyone’s guess, but during that time, when the most luxurious way to travel was by train, the Super Chief was one of the most luxurious trains. Clearly, those numbers would be quite high. But the Super Chief was not alone; the California Zephyr, the City of Los Angeles, and the Coast Daylight, all had their share of celebrities. The Zephyr, City of LA, and the Super Chief all were Chicago to LA trains, and two of them offered a through sleeper to New York City. The Chief utilized both the Broadway Limited and the 20thCentury Limited as through service to New York City, alternating every other day between the two railroads. However it was the Super Chief that won over the majority of the Hollywood elite. 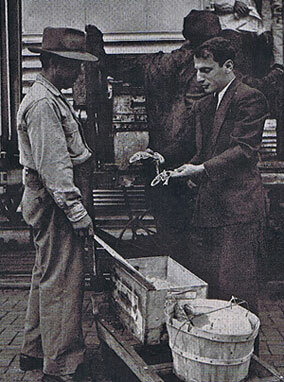 The railroad assigned a service agent directly to and at Hollywood to help facilitate travel for the stars. He would also make press releases whenever a Hollywood personality would be riding the train. The Santa Fe Railroad made Pasadena a regular station stop for the Super Chief, this allowed for a more convenient and less public arrival and departure for the Hollywood celebrities. 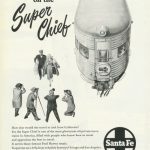 The list of those riding the Super Chief featured some of the biggest names in the industry during that time: Zero Mostel, Bing Crosby, James Cagney, Humphrey Bogart and Lauren Bacall, Judy Garland, Richard Burton and Elizabeth Taylor, Desi Arnez and Lucille Ball, and Dean Martin and Jerry Lewis. However, I don’t think that either Lassie or Rin Tin Tin ever rode the train. 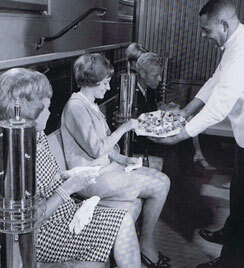 The Super Chief dining car steward checks out fresh caught trout en route. 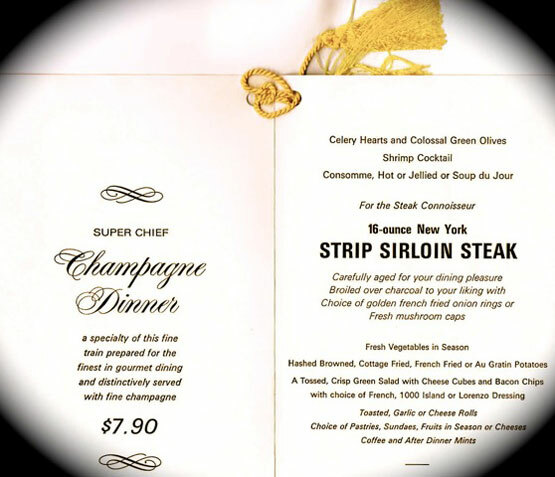 Caviar, lamb chops, and filet mignon were just a few items you could order off the extensive menu. 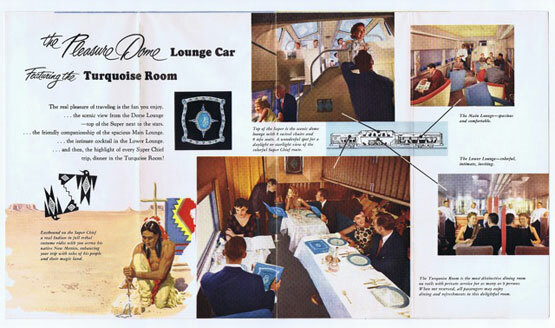 When the Santa Fe introduced its new Pleasure Dome-Lounge cars in 1951, they included the Turquoise Room, the only private dining room available on a passenger train. 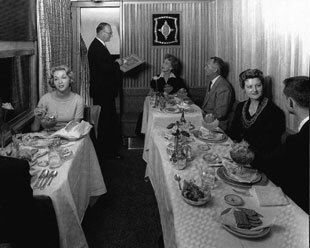 A passenger on the Super Chief could reserve the room for either dinner or a cocktail party; the room could hold up to 12 guests. It was amenities like this that made this train a cut above the rest. The Panama, Broadway, and 20th Century Limited, and even the Super Chief could not hold a candle to the greatest celebrity special ever, The Great Gleason Express. 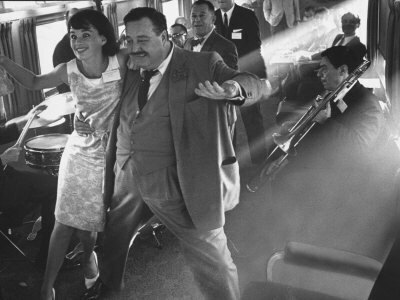 Jackie Gleason did not like to fly, so in 1962, CBS contracted him to do a weekly one hour variety show (The American Scene Magazine) in New York. Jackie moved his entourage (40 people) there by a private train. It was a ten day 4000 mile junket from LA to New York City, costing $90,000.00. Now in New York, and with a new title, The Jackie Gleason Show, Jackie got quickly tired of New York City’s long and cold winters. So in 1964 he convinced CBS to pull up stakes in the “Big Apple” and move to the “Sun and Fun Capital of the World”, Miami Beach. And how was the Jackie Gleason Show going to get there? By train, of course! Enter the Great Gleason Express II, the greatest rolling cocktail party in history. In August of the year 1964 a special 14 car passenger train waited at Penn Station in New York for 113 riders. Steve Lawrence, June Taylor and her dancers, the musicians, and all their families, as well as a specially hired Dixieland Band, rolled out of town for Miami Beach. “How Sweet It is!” The train had a special dinner menu and, of course, an open bar. Over 500 pounds of meat and 2614 one-shot liquor bottles were consumed. Needless to say, there was also a fair amount of aspirin (40 boxes to be exact) and plenty of Bloody Marys to go around the next morning. The Great Gleason Express was greeted in Miami by thousands of cheering fans. Celebrities loved to pose by a train, or should I say, the railroads loved to have celebrities pose by their passenger trains. Remember the photo of Lou Gehrig and Babe Ruth standing on the back platform of the Seaboard Florida Limited (in part 1 of this article)? There are enough good quality figures available to stage your own publicity photo shoot. Either on an observation car’s back platform or standing on the station platform. Walthers even makes a model of LA Union Terminal. They also make a smaller Santa Fe Mission style Station that could substitute for the Pasadena station. A Hollywood starlet could have just disembarked from the Super Chief to be greeted by the Hollywood press on the station’s platform. Modeling the trains themselves is a lot easier and cheaper now then it has ever been. No longer does one have to spend three or four thousand dollars buying a brass passenger train. Perfect recreations of the Century, the Broadway, and of course the Super Chief are now available in plastic. Even though no detailed photos of the Great Gleason express could be found, a safe bet is to do a mixture of PRR, Sal and ACL passenger cars. The last car could have a banner along the side proclaiming it as the “The Great Gleason Express”. You could even have a Hollywood premier on your layout! Grauman’s Chinese Theater would be very difficult to model, so you would need an alternative building. SS Limited makes a very nice Art Deco style theater. You could have two or three searchlights on flatbeds in front of the theater. Limousines could be at the curb with the media and fans all around. Make sure you don’t forget the red carpet. You could even do the famous Hollywood Walk of Fame in the sidewalk in front of the theater. 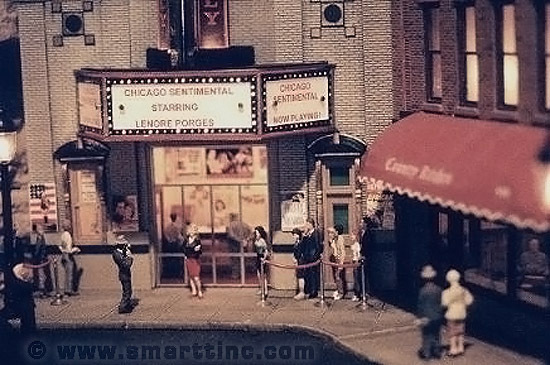 Adding a little touch of baseball and Hollywood would be a great way to make your model railroad more interesting and unique.